Well, after providing my school magic show fundraiser to many many schools and having raised thousands and thousands of dollars for other schools while also providing a wonderful family fun evening of great entertainment, the roosters have come home to roost so to speak. 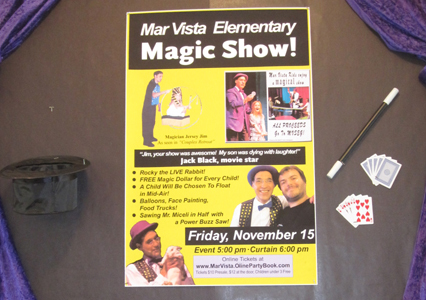 My son’s school is finally hosting my Funtastic Magic Show Fundraiser! 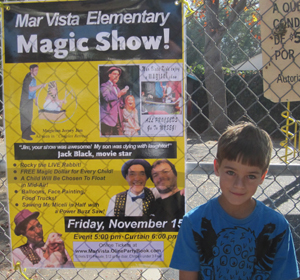 Here is a picture of my son, Wesley, standing in front of one of the posters at school. Even better, Wesley is going to be performing his special illusion that we talked about in another post. We’ll let you know how it goes! Schools typically raise between $2000 to $12,000 in a single night of family fun entertainment without much work or lead time. This is not your typical magic show. This is the same 90-minute production I bring to professional theaters throughout southern California. This entry was posted in What's Up Jersey Jim? on November 13, 2013 by Jim.